UPDATE: The real update is there has yet to be an update. We — and others — haven’t heard back from Mattel yet, despite increasing negative reviews of the book. SECOND UPDATE: Mattel has responded to the book’s critics. It’s taken the media at large many months to catch on, but Amazon reviewers have been up in arms over a book from Mattel’s “I Can Be” Barbie series, I Can Be A Computer Engineer (Mattel created a Computer Engineer Barbie in 2010 as well) for months now. Why? 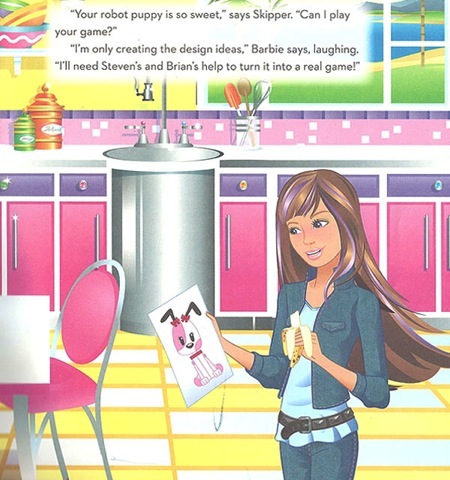 Because Barbie doesn’t seem to actually do anything a computer engineer does, only has the skills to design a game and needs the help of men to code it and heck, she can’t even reboot her computer right. Let’s set the scene, as noted by Pamie.com yesterday and subsequently posted to Reddit: Barbie is working on her laptop one morning, eating yogurt as one does in front of computers, and Skipper asks what she’s up to. She’s busy computering, it seems. Right on, girl power! Wait — designing adorable puppies is one thing, but they need to be coded. Those are not the messages parents say they want their daughters to hear, as reviewers have been noting on the Amazon reviews of the book since January. It’s part of a two-pack offering along with I Can Be An Actress. Of course there’s been an avalanche of negative reviews since yesterday, but the bad reviews stretch back 11 months. I found the sexist drivel that this book portays[sic] to be especially inflammatory, so much so that I’ve placed it near my fireplace for emergency use during a power outage. The demeaning words add extra fuel as they certainly come from the fire of hell itself. Also wonderful for starting your backyard grill. I just read this book, and it’s incomprehensible how misogynistic it is. I wouldn’t be surprised if it got removed from the shelves soon. An appalling representation of how women act in the world of technology. A girl needs a boy to do anything of value. Women are not able to fix their own computer problems. Girls need boys to do their work for them but can simply take the credit and no one will worry about who really did the work since, duh! a girl couldn’t have done it by herself. To add insult to misogynist injury, the depiction of “computer engineer” has nothing to do with either engineering or computer science. As far as I can tell, this story seems to think “computer engineer” means being utterly ignorant of how computers work, and not actually using them to write software. Do your daughter a favor, and just download the past year of @SwiftOnSecurity’s tweets, instead. She’ll learn far more about computer security, engineering, and girl power from a real fake girl than from this waste of tree carcasses. Wow, and here to think I’ve been foolish enough to do my own work all these years when I could have just found some boys to do it for me. Where were Steven and Brian when I had to write my dissertation? Seriously, with all the hard work so many are putting in to make sure that girls know that computing can be a great career for them it’s absolutely appalling to see something like this out there to reinforce the gender stereotypes. I wish I could say this is the first time we’ve seen a major company send a message like this, but of course there was “Math is hard” Barbie, followed by a slew of bad retailer decisions that, intentionally or not, tell girls they can’t do something boys can do, or should like only stereotypically girl things like shopping and the color pink. We’ve reached out to Mattel for comment and will update this post if we get a response.